I’ve been thinking about how much is ‘out there’ for us to enjoy. Books, films, all those TV dramas and comedies – if you miss the good ones they are now available on demand. People on social media share how much they’ve enjoyed it, so you make a mental note to catch that new series when you can. Of course that does not include online, the stars whose fans await their next video, a brand new form of entertainment more suited to young people who are less tied to TV. “I’ll just watch one more”, you think to yourself, even though it’s getting late. And there is always one more. Then of course, there is gaming, new and increasingly interactive, better graphics, better storylines. It’s all there for the taking, for the enjoying, 24/7. Which brings me to how I’ve been feeling recently. It’s as if all my consuming of these wonderful books, films, fantastic comedies and dramas and so much more is in danger of crowding out my creativity. Like many writers I also have a day job, so my precious evenings and weekends only have so many hours in them. It’s beginning to feel like a whole lot of ‘shoulds’. And I’m sure that’s because the creative part of me is frustrated, shouting: “Enough! Now it’s my turn! I need to express myself!” But at the same time the consuming part of me is whispering: “Relax, you’ve earned some down time. Sit back and enjoy.” When I’m tired in the evenings, it is easy for that consuming side to win, but then I feel bad because I know beyond any doubt that for me the balance is not good. So how can the balance be adjusted? What can I do about this? In my teen novel (published by Scholastic) ‘Diary of a Parent Trainer’, parent trainer extraordinaire Katie talks about Grown Ups having ‘modes’ and ‘functions’ (such as ‘Bored’ mode’, ‘Angry’ mode’ and the most annoying one of all: ‘Been There Done That’ mode’). Well, I think that I need to find ways to switch to ‘Create’ mode. I’ve got an action plan and I thought I’d share it with you, in case you are in a similar position, and want to be more creative. Have a creative space, even if it’s just a corner of a room. A surface to write or paint on, your materials. A notebook or your keyboard. Whatever works. But have it in a place where you are never consuming, but always creating. I now have my writing shed, but the way I avoid going out to it brings me to my next point. Make an appointment with yourself to be creative. Put it in your diary, highlight it to show it’s important. Or set an alarm on your phone. Whatever you do, mark the time aside. No excuses. And make it a regular appointment. Use a timer if that helps. Waste a little time. Don’t rush into your work of genius straight from homework or housework. Dream. Look out of the window. Get in the zone. Scribble in a notebook or diary, or both. 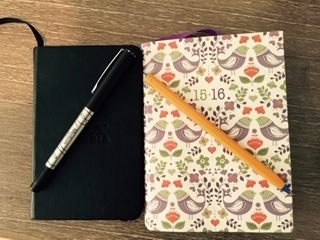 I keep a daily diary and I also write thoughts as they occur to me in my trusty notebook (both are pictured). These are private thoughts, scraps of ideas and observations. All part of the creative process. Shut out distractions. Wear headphones if you need to, listen to classical music or something like Noisli or any other app that plays you ambient sounds such as waves, rain or something that will shut out the world and transport you to a place where you can find inspiration. With so many new channels for entertainment of all kinds, the world is hungry for more new stories, for more magic, for fresh new ideas. There are so many opportunities for young creative people to express themselves, in ways older generations never dreamed of. So if you are creative, but with all these temptations in your busy life, be careful not to slip too much into ‘Consume’ mode. Make sure that you balance it up in your spare time with ‘Create’ mode because, believe me, the world wants to hear from you! Wise words! I am often oppressed by the pressure to ‘consume’ the next boxed set. Thinking time is precious. And one kind of creativity feeds the other kinds – sometimes when a book is fighting me, I go off and take photographs – re-charges me to fight back!